A colorful gemstone grid aligns with chakra energies to achieve a harmonious sense of well-being. From Alok Jain in India, the sterling silver necklace glistens with amethyst, iolite, citrine, peridot, garnet, blue topaz, and carnelian. Their colors correspond to a specific chakra. Clear and light purple stones are associated with the 7th chakra (awareness and wisdom); the purple, violet and indigo gems with 6th chakra (insight and perception), and the blue or light blue with the 5th, that of communication and truth. Green and pink stones are for love and compassion, linked to the heart, on the 4th chakra. For inner power and will, the 3rd chakra is associated with yellow gems, whereas emotion and sexuality are linked to red and orange gems for the 2nd chakra. Black gems are used to stimulate the 1st chakra, that of stability and security. In Sanskrit, chakra refers to an energy vortex through which vital universal forces are channeled, and there are believed to be seven in the human body. When all seven are aligned the person feels a healthy sense of well-being. 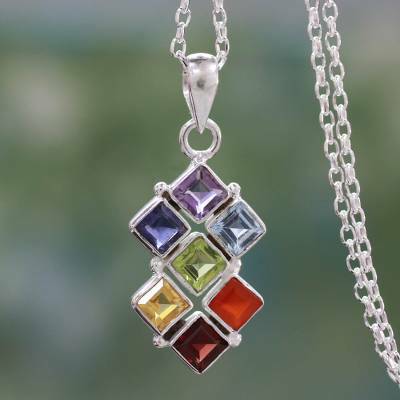 You can find multi-gemstone chakra necklace 'Wellness' by Alok Jain in jewelry categories such as Chakra Necklaces, Birthstone Necklaces, Amethyst Necklaces, Iolite Necklaces, Peridot Necklaces, Blue Topaz Necklaces, Garnet Necklaces, Citrine Necklaces, Carnelian Necklaces, Multigem Necklaces, Silver Necklaces, Sterling Silver Necklaces and Pendant Necklaces. Enjoy exploring these sections for other Novica treasures. "Unusual square stones make a very pretty pendant." I liked this pendant more upon receiving it than when I ordered it. It has a nice and weight and the workmanship is very good. I wear it with a pair of blue topaz earrings I also got through Novica. I purchased this for my sister and she wears it all the time. This is a solid piece, good weight and the colors are soft but distinct. I have purchased two other necklaces from this designer and they were all beautiful and perfect for the people I gave them to.